Could a special kind of sea cave give scientists an insight into what life is like on other worlds? When someone says that he or she is going diving, the first thing that probably comes to mind is coral reefs and tropical fish. What you might not immediately think of is a submerged inland cavern cut off from surface oxygen, but these "blue holes" may contain vital clues in the search for extra-terrestrial life. 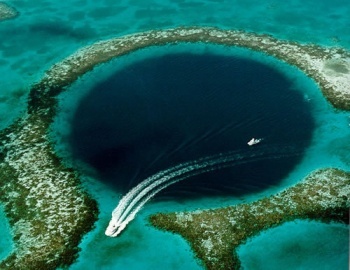 In a blue hole, a layer of fresh water sits on top of the salt water and prevents any oxygen from entering it. This creates an unusual environment that researchers believe might mimic submerged pockets of water on Mars, or Jupiter's moon Europa. Exploration of the blue holes in the Bahamas revealed unique ecosystems in each one, with no shared species. Astrobiologist Jenn Macalady believes that if scientists can understand how microbes survive in that environment, they would have a good idea of what to look for on other planets. This research could contribute to one of the most important scientific discoveries of all time. All it will take is the discovery of a single microbe on another planet to prove extra-terrestrial life once and for all, and these blue holes might just help us find one.